Beth Revis Carrie Ryan Megan Shepherd We have rescheduled this event for March 30! On Saturday, March 30 at 12:00 p.m. City Lights Bookstore will host three terrific Young Adult authors for a reading and panel discussion. Beth Revis, Carrie Ryan and Megan Hansen Shepherd will discuss their work and read from their new books. Beth Revis is the author the Across the Universe series and will present her latest installment, Shades of Earth. Carrie Ryan is the author of the Forest of Hands and Teeth series and has also been included in some recent YA short story collections. Asheville resident, Megan Hansen Shepherd will present her first novel, The Madman’s Daughter, which is the first book of a trilogy. These authors are among the favorites of some of the staff here at City Lights so come early to get a seat and don’t miss out on the chance to meet these talented writers. To reserve copies of their books please call City Lights Bookstore at 828-586-9499. Beth Revis is the author of the NY Times Bestselling Across the Universe series, published by Razorbill/Penguin in the US and available in 17 countries. The first book in the trilogy, Across the Universe, is a “cunningly executed thriller” according to Booklist, and the second book, A Million Suns, was hailed by the LA Times as “a fast-paced, action-packed follow-up.” The final book of the trilogy, Shades of Earth, will be released in early 2013. A former teacher, Beth lives in rural North Carolina with her husband and dog. Her goals include travelling around the world in 80 days, exploring the moon, and finding Narnia. Victoria Schwab is the author of The Near Witch--which Kirkus praised for its “shivery horror tang”--as well as newly released The Archived and several upcoming novels. Victoria suffers from a wicked case of wanderlust, but when she's not haunting Paris streets or trudging up English hillsides, she can usually be found tucked in the corner of a coffee shop in Nashville, sipping tea and dreaming up monsters. What: Authors Beth Revis, Carrie Ryan and Victoria Schwab will appear as part of a group tour to discuss their young adult novels. When: Saturday, March 16, 2:00 pm. Admission: In order to go through the signing line and meet the authors for book personalization, please purchase one of their books from Blue Willow Bookshop. At the time of your purchase, you will receive a signing line ticket that indicates your place in line. A limited number of autographed copies of the authors’ books will be available for purchase after the event. If you cannot attend the event, but would like a personalized copy of one of their books, and can stop in and pick up the book, please call us before the event at (281) 497-8675. See below if you would like to order a copy online and have it shipped to you. Join us for a group event with some of the hardest working authors of fantasy adventure series for middle graders. All 3 have new Riordan-esque series underway that include modern adventure with historical elements. Here's the lineup: Peter Lerangis, Seven Wonders 1: The Colossus Rises Teens Jack, Marco, Aly, and Cass begin a quest to find seven pieces of Atlantis's power that were hidden long ago and that will, if returned to Atlantis, save them from certain death due to the genetic abnormality that also gives them superior abilities. Here is the site for the series. Peter Lerangis is the author of more than one hundred and sixty books, including two books in the New York Times bestselling 39 Clues series (The Sword Thief and The Viper's Nest) and one book in The 39 Clues: Cahills vs. Vespers series (The dead of night). Together, his books have sold more than five million copies and have been translated into twenty-eight different languages. Peter is a Harvard graduate with a degree in biochemistry. He has run a marathon and gone rock climbing during an earthquake--though not on the same day. He lives in New York City with his wife, musician Tina deVaron, and their two sons, Nick and Joe. In his spare time, he likes to eat chocolate. Jennifer A. Nielsen, The Ascendance Trilogy 2: The False Prince A kingdom teetering on the brink of destruction. A king gone missing. Who will survive? Find out in the highly anticipated sequel to Jennifer A. Nielsen's blockbuster The False Prince! Here is the series page on the author's site. Jennifer A. Nielsen is the acclaimed author of the first book in the Ascendance Trilogy. She has also written The Underworld Chronicles, a humorous middle-grade fantasy series. Jen lives in northern Utah with her husband, their three children, and a perpetually muddy dog. Lisa McMann, Infinity Ring 3: The Trap Door The year is 1850, and the nation is divided over the issue of slavery. The Underground Railroad provides runaway slaves escape to freedom. But the SQ has taken control of the Underground Railroad from within. Now Dak and Sera are left wondering who to trust . . . while Riq risks everything to save the life of a young boy. Here is the series' site. Lisa McMann is the New York Times bestselling author of Fade and Wake, as well as many short stories, one of which won a Templeton Award. She grew up in Michigan and now lives in Arizona with her husband, two kids, dog, and cat. All 3 authors will share their books, answer fan questions, and sign books. If you purchase a copy of the first two books of Infinity Ring, you'll receive bookplates for signed by James Dashner (Book One: A mutiny in time) and Carrie Ryan (Book Two Divide and Conquer). Free. If you love the 39 Clues Series, you have to try the INFINITY RING. Created by bestselling author James Dashner, the INFINITY RING SERIES is an alternate-history time travel adventure series that combines books, an interactive "Hystorian's Guide" map feature, and a fully-immersive online game experience. We are excited to introduce Lisa McMann as she introduces the 3rd book in this exciting series. In THE TRAP DOOR, the year is 1850, and the nation is divided over the issue of slavery. The Underground Railroad provides runaway slaves escape to freedom. But the SQ has taken control of the Underground Railroad from within. Now Dak and Sera are left wondering who to trust . . . while Riq risks everything to save the life of a young boy. It's the perfect adventure to get into during February and Black History Month. Meet Lisa McMann and learn more about the INFINITY RING adventure. If you purchase INFINITY RING books 1-3, you will get book 3 signed by Lisa McMann, but also signed bookplates for Book 1's author James Dashner and Book 2's author Carrie Ryan. If you cannot attend this event, but would like a personalized, signed copy, please contact the store at 215-256-9311 to make arrangements. 3PM SATURDAY, FEBRUARY 9 Tween Event | Launch Party | Lisa McMann:Infinity Ring Book 3: The Trap Door ﻿New York Times bestseller Lisa McMann, author of the Unwanteds series and the Wake trilogy, visits to launch Infinity Ring Book 3: The Trap Door. ﻿Following their time-traveling adventures in A mutiny in time (by James Dashner) and Divide and Conquer (by Carrie Ryan), Dak, Sera, and Riq return to the United States and walk immediately into a deadly trap. They've traveled to the year 1850, and the nation is divided over the issue of slavery. In these dark days, the Underground Railroad provides a light of hope, helping runaway slaves escape to freedom. But the SQ, the shadowy organization that controls America, has taken control of the Underground Railroad from within. Now Dak and Sera are left wondering who to trust, while Riq risks everything to save the life of a young boy. ABOUT THE AUTHOR Lisa McMann is the New York Times bestselling author of the Wake trilogy, Cryer's Cross, Dead to You, and the middle-grade dystopian fantasy trilogy The Unwanteds. She lives with her family in the Phoenix area. Read more about Lisa and find her blog at LisaMcMann.com. Or better yet, be her friend on Facebook (McMannFan) or follow her on Twitter (@Lisa_McMann). Nine YA authors answer your questions about writing for teens and the publishing industry. Meet Tessa Gratton, Jackson Pearce, Myra McEntire, Brenna Yovanoff, Carrie Ryan, Victoria Schwab, Sonia Gensler, Saundra Mitchell, and Beth Revis! Booksigning to follow discussion. Schuler welcomes the Smart Chicks Kick It young adult author tour!!! We are absolutely giddy to present this gathering of fantastic young adult authors, organized by #1 bestselling author Kelley Armstrong, the creative force behind The Darkest Powers and The Darkness Rising trilogies! Kelley is bringing a slew of her lady author friends for a sole Michigan appearance to celebrate young adult fiction and amazing female authors! Joining her will be Melissa Marr, author of the bestselling Wicked Lovely series; Jennifer Lynn Barnes, author of seven young adult novels including Raised by Wolves; Melissa De La Cruz, author of the bestselling Blue Bloods series; Carrie Ryan, author of the bestselling Forest of Hands and Teeth series; and Rachel Caine, internationally bestselling author of over 30 books, including the Morganville Vampire series. Tickets will be available at our Eastwood Towne Center location starting at 9:30 a.m. on Tuesday, September 20, the release date of Enthralled, a new story collection edited by Melissa Marr and Kelley Armstrong and featuring five of our visiting SCKI authors ! Tickets 1-100 are $5.00 each, which ensures a seat for the event and includes a $5.00 Schuler gift card that may be used towards the purchase of any of the participating authors’ works, or at a later date at any of our stores or at SchulerBooks.com. Tickets 101 and greater are standing-room only, and available with no purchase necessary. The signing will proceed after the author talk in ticket number order. Tickets can be reserved by phone starting September 20 by calling the store at 517.316.7495. CARRIE RYAN promotes The Dead-Tossed Waves. Carrie Ryan's book The First Time was available from LibraryThing Member Giveaway. 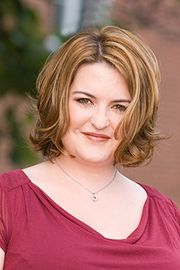 Carrie Ryan is currently considered a "single author." If one or more works are by a distinct, homonymous authors, go ahead and split the author. Carrie Ryan is composed of 2 names. You can examine and separate out names.